Pampering and self-care markets have exploded in the past decade as the need for a more flexible approach to self-care arise. No longer are consumers beholden to strict scheduling or leaving the comforts of their own home to receive treatment for their aching feet and toes. Portable technology has given foot pain sufferers a new lease on life by allowing them to care for their feet on their schedule and at their leisure and comfort. With different foot ailments on the rise, the need for foot care is higher than it’s ever been. Things like Plantar Fasciitis, heel spurs, hammertoe, bunions, diabetes and so much more have lent a sort of urgency to the need for easy ways to ensure our feet our able to keep us moving and mobile. That’s right! The treatment of your feet can affect your health. For you who might not know, your feet tends to have more than 50 bones, 60 joints, and 200 muscles, along with tendons and ligaments that hold them together and help them move. So, yes, that’s a lot of little parts to strain and sprain and poke with tasks that are part of your daily activity. Just the act of walking can put tons of force on your feet, and because your feet are the furthest away from your heart, it’s easy for circulation issues to arise. And that’s just the health issues, ultimately the appearance of your feet can be very important on a hot day at the beach or when showing off those new sandals. Foot health shows inside and out and having soft heels, and clean nails, is always desirable and preferable to the alternative. Here you’ll see a list of the top 5 best massaging home foot spas that are guaranteed to help you maintain the best foot health. Whether it’s just cosmetic or medical, these units will add versatility and creativity to your pedicure routine. Furthermore, they will do the work of ten pedicurists and will relieve not only your rough and tired feet, but your overall mood as well. They are definitely worth the investment. This invigorating pedicure foot spa includes many features designed to pamper your feet back to good health. 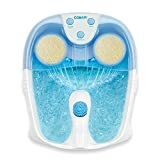 The soothing massage bubbles provide a fun and gentle way to add light pressure to your feet while you bathe them in water that is heated by the SMART heat system included in the unit. Dr. Scholl’s invigorating pedicure foot spa also comes with a, removable, pumice stone that softens and sloughs away hard, dead skin from your heels and the pads of your feet. 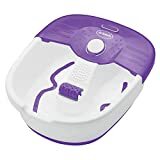 The unit also comes with a 5-piece pedicure set that includes toe separators, clippers, a toe brush, and a convenient little bag to carry them all in. Overall this unit is a great buy with a lot going for it. Keeps the water hot and circulating during your massage session. The rollers are very comfortable to use. The unit is large enough for size 9 feet. The pumice stone is nice and removable for easy cleaning. The bubbles add a nice soothing effect. The SMART heat system is used more to maintain the temperature of existing water rather than heating. It’s best used with hot water. The unit can be a little shallow though a simple towel helps absorb water that might fall out of the tub. Foot care becomes a total body event with the Conair Waterfall Foot Spa. The tranquil, relaxing sound of the Conair Foot/Pedicure Spa with Waterfall, Lights and Bubbles’ waterfall and the massaging streams of water that massage your upper feet and pamper your toes are just some of the features that make this foot spa stand out from the rest. The soothing bubbles help alleviate any stress that has built up in the feet and lower legs, and the included pumice pods leave your skin feeling silky and callous free. Though the foot spa does not come with a heater, it will keep heated water warm for about 20 minutes which is more than enough time to complete your beauty regimen. The spa also has soft blue LED lights under the water that help you relax and lend to the overall spa feeling this unit evokes. In addition to the pumice stone attachments, there’s also a gentle scrubbing brush, and a soft-touch massager included. And for your convenience, there are three toe-touch controls that activate high and low bubbles, the waterfall and the lights. Along with a one-year warranty, this foot spa is well worth the investment. Pumice stones and massage rollers are removable. Innovative waterfall action soothes and massages the tops of feet and rejuvenates tired toes. Fits all the way up to a Men’s US 13 size comfortably. No heater system. Though it maintains the heat of the water poured in for up to 20 minutes, it doesn’t heat the water directly. It’s best to use pre-warmed or hot water. Might be a bit noisy for some users. The foot placement can take some getting used to. It’s at an angle to promote circulation, but it could lead to discomfort for some users. 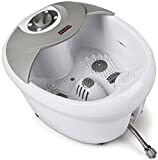 The Kendal All-in-One Foot Spa Bath MS0809 includes heating therapy, high-frequency vibration massage, and massaging oxygen bubbles to give you the most complete and relaxing pedicure experience. It promotes circulation and improves metabolism while relieving fatigue and giving a much-needed boost to the Qi system of meridians. Meridians are a network of channels that transport Qi (life energy). There are “acupoints” along the meridians where the Qi is accessible. Stimulation of the acupoints through massaging pressure or heat, influence the local area and various functions of related organ meridians. This matters to those most ardently interested in the healing therapy known as Reflexology. With its comfortable massaging vibrations and oxygen bubbles meant to stimulate different parts of the foot, this foot spa fits in beautifully with any reflexology based regimen. The unit also uses reliable PTC heating that heats the water quickly and maintains a constant temperature with its secure multi insulation protection. There are three pre-set programs with different combinations that alternate the bubbles, vibrations, and heat to ensure a personalized experience. An attached hose allows for easy drainage and easy cleanup. And this beautiful and elegant machine comfortably fits up to a Men’s US size 14. Easily add bath bombs, salts and oils to customize your pedicure experience. Deep enough to comfortably fit feet with little to no overflow. You can operate each mode separately depending on your needs. The angle can be slightly uncomfortable based on how you sit. Drainage can be slow, and the unit can become heavy when filled with water. Two of the settings appear to do the same thing. 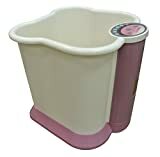 The 14” deep tub of the FootSmart Foot and Leg Spa will transform your home into a spa oasis. Indulge in the comfort of your own home as two powerful heated water jets deliver an invigorating massage to your feet and calves. Each of the water jets produces 300 strong air bubbles that stimulate your reflexive zones providing pampering yet invigorating pressure to your sore and achy muscles. There are also four invisible massaging rollers that massage your feet and calves. You can customize the water temperature from 96 – 116 degrees Fahrenheit and a timer that can be set up to 60 minutes. Rollers and an automatic water drain valve let you move the unit around with relative ease, and it’s made of ABS plastic meaning it will last through several types of wear. Easy cleanup and care make it convenient to pamper yourself any time of the day or night at your leisure. Extra deep tub fits your feet and calves for the ultimate pampering experience. Drainage system allows for quick cleanup and easy transport. Invisible rollers provide extra stimulation and massage. The rollers are removable, but don’t move. You’ll need to move your foot over them which can mean limited movement. The unit can be a bit narrow for some users. The pressure of the bubbles varies and can be considered a bit week for some. The HoMedics Hydro-Therapy Foot massager is an aesthetically pleasing massager whose function outweighs its form. Four streaming hydro-therapy jets deliver a deep, soothing massage intensity to pressure points in your heels, arches, and toes. There is a center massage mode as well as different settings that allow you to customize your pampering experience. Soothing LED lights add a spa-like atmosphere to your home. Hydrotherapy designed to give your deep soothing massage. Vibrating massage provides relief to tired heels. No heating element limits the soaking time. The bath is rather shallow as it focuses on the heel and not the entire foot. Can be a bit noisy for some. If you were to choose from the mentioned Top 5 Best Massaging Home Foot Spas then Dr. Scholl’s Invigorating Pedicure Foot Spa would make for a good choice. The said unit is easy to use, offers customization, and provides a spa-like experience you’ll be grateful for.